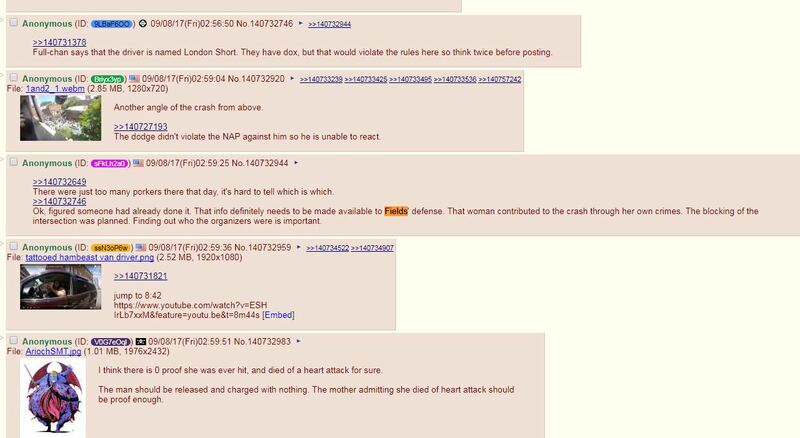 White nationalist and fringe media figures are trying to absolve Heather Heyer's alleged murderer by suggesting she died of a heart attack caused by health issues, not from a car running her over. 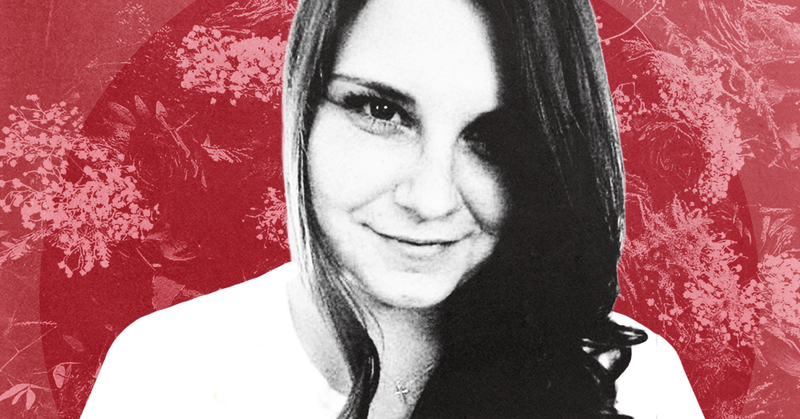 On August 12, during a gathering of white supremacists in Charlottesville, VA, James Fields, a man with white nationalist sympathies, reportedly drove his car into a crowd of protesters, injuring at least 19 and killing Heyer. Fields has since been charged with second-degree murder. 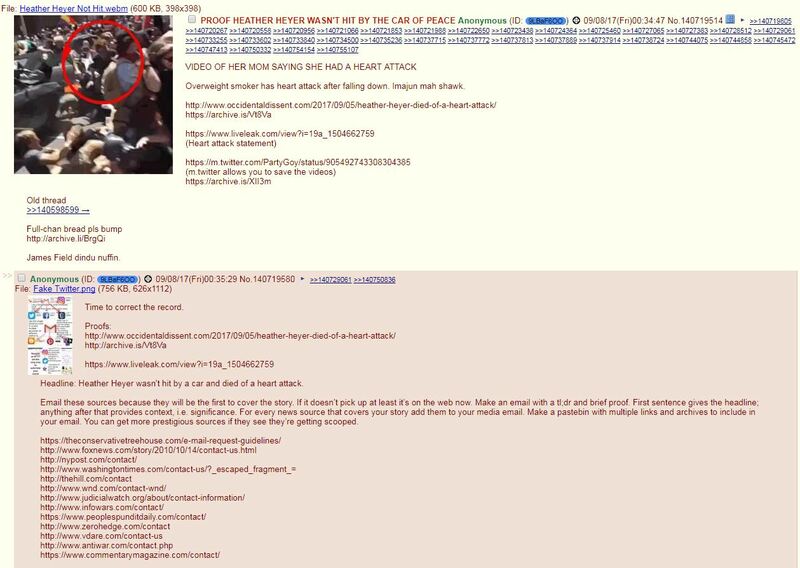 This is not the first attempt by those in the far-right and fringe to distance themselves from the gathering and subsequent violence in Charlottesville. Fringe media have previously suggested that white nationalist Jason Kessler, one of the organizers of the protest, was some kind of liberal spy who set up the event to embarrass conservatives. 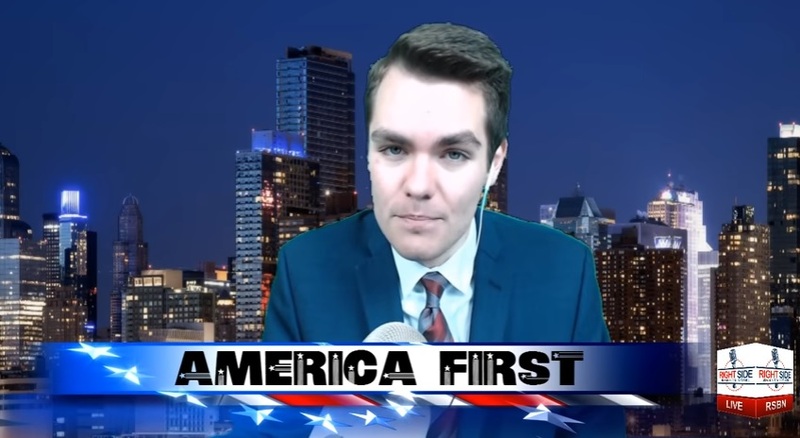 Nicholas Fuentes is a college student who had hosted the pro-Trump program America First for RSBN. In April, he falsely claimed that Muslims and immigrants are not protected under the First Amendment and called for the people who run CNN to be “arrested and deported or hanged” (the network later apologized). 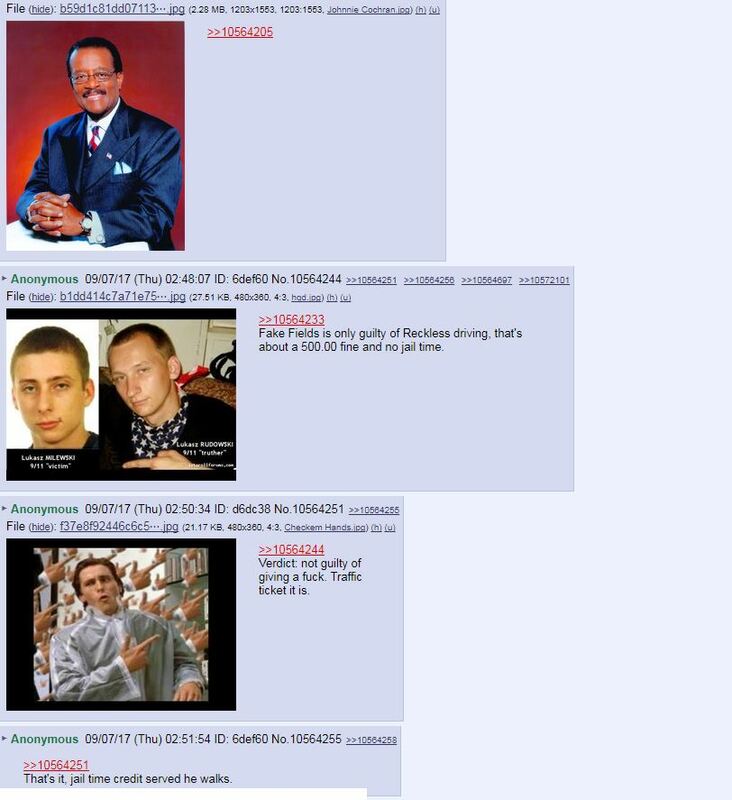 Network CEO Joe Seales told Media Matters in an email that “we are no longer running his show as of right after Charlottesville.” He added that the parting was “honestly a mutual decision based on both of our interests- we brought the issue up of Charlottesville being a huge distraction and not falling in line with some of our core beliefs- and ultimately all of us decided was best we ended the show. 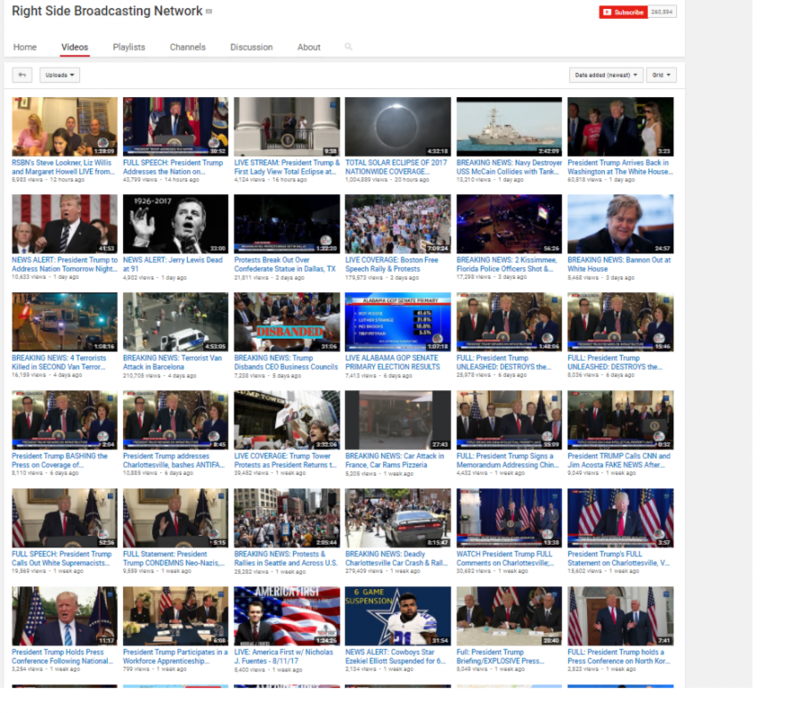 We believe Nick is very talented and wish him well.” RSBN last aired his show on August 11, according to its YouTube page. Fuentes tweeted over the weekend that he is "officially leaving America First on @RSBNetwork to pursue my own independent venture." He added: "Much love to RSB family - they took a chance on me & went above & beyond to support my show. I wish the Seales family the best! God bless!" Fuentes also recently stated that he would leave Boston University, where he's been a student, because he "didn’t feel safe" and instead would attend Auburn University. He was reportedly admitted to Auburn for the fall 2017 semester but "did not confirm his enrollment" and "will have to specifically apply for the spring semester” if he wants to attempt to attend the school (paragraph updated to reflect AL.com’s revised report about Fuentes and Auburn). The white supremacist rally this past weekend in Charlottesville, VA, which began on the campus of the University of Virginia, has raised concerns about similar activities happening at other colleges. Higher education media report college officials are growing concerned as white nationalist groups seek to hold similar events on more campuses throughout the U.S. These attempts represent an escalation of an ongoing right-wing assault on colleges. 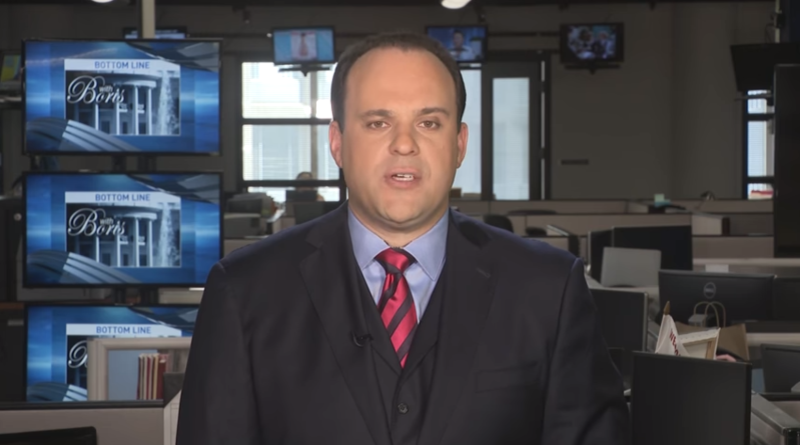 Former aide to President Donald Trump and current administration media shill Boris Epshteyn is now using local television news spots across the country to back Trump in his disgraceful “both sides” treatment of violent neo-Nazism and white supremacy in Charlottesville, VA.
Epshteyn is the chief political analyst of Sinclair Broadcast Group, a conservative local TV giant that currently owns and operates 173 stations in 33 states and the District of Columbia. He produces several 90-second commentary videos each week, which Sinclair dictates must be aired on all its stations nationwide. There is apparently no required disclosure Epshteyn must make in the segments he produces to inform viewers across the country that they’re hearing commentary from a former Trump staffer, even as his defenses of Trump’s most indefensible moments grow increasingly embarrassing. Epshteyn may have reached a new low last night with his take on Trump’s chilling defenses of neo-Nazis and white supremacists who rallied in Charlottesville last weekend. On August 11, a white supremacist "Unite the Right" rally kicked off with a tiki torch-wielding mob chanting "Jews will not replace us" on the University of Virginia campus in defense of a Confederate statue. 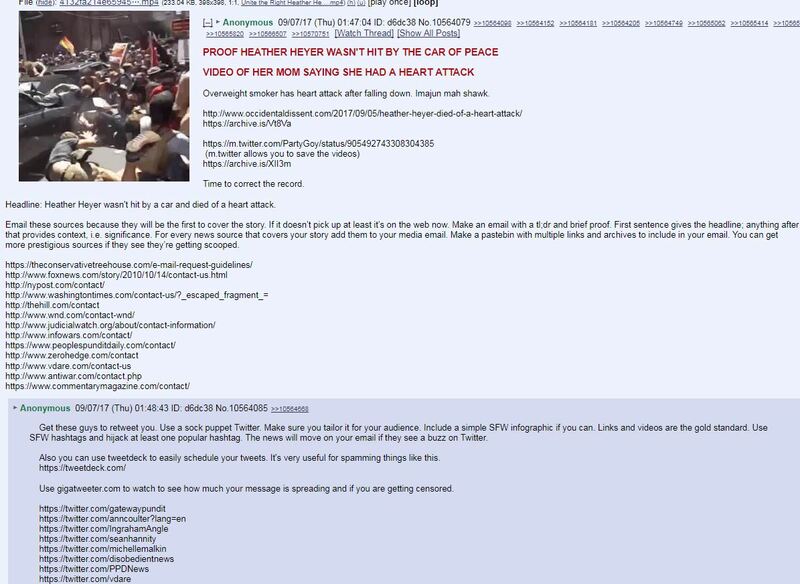 The next day, the large gathering turned violent, when a neo-Nazi drove a car into the crowd of ralliers and counter-protesters, murdering anti-racism activist Heather Heyer. On Saturday, Trump issued a short statement refusing to specifically call out the white supremacists and neo-Nazis behind the rally, instead pointing to blame "on many sides." Following two days of intense criticism, Trump issued a low-energy statement Monday nominally condemning the KKK and white supremacists, then completely undermined that statement in an unhinged Tuesday press conference where he returned to pinning blame on "both sides," and claimed that there were "very fine people" included among the white supremacists. Epshteyn ends the segment with a personal note, explaining that he is Jewish and thus knows that Trump is not anti-Semitic. This analysis, however, does not account for years of Trump’s public footsie with prominent white nationalists and anti-Semites, including former KKK grand wizard David Duke. Local TV news viewers from Maine to Utah -- including some in Charlottesville’s backyard -- may have seen this segment last night or this morning as they turned to their local station for the news of the day. Folks in other cities and states across the country are also watching, waiting to hear if Sinclair will soon own their local TV station and extend the reach of its Trump apologism to Chicago or New Orleans, too. Angelo Carusone on The Bill Press Show: Trump's defense of white supremacists in Charlottesville "sounded exactly like Fox News"
On MSNBC, member of Trump's diversity coalition says "the left-wing media and white supremacists have a synergistic relationship. They feed off of each other."